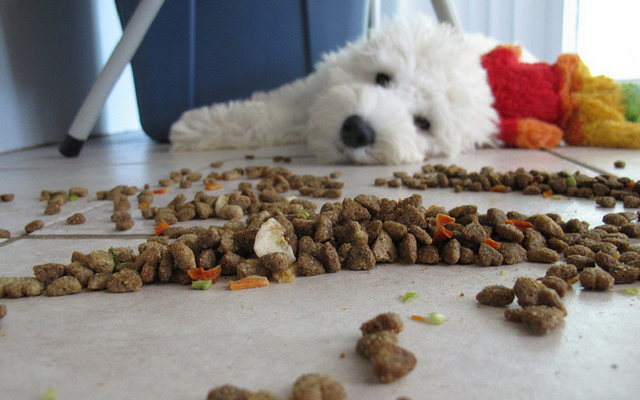 Dogs vomit for a number of reasons; some are relatively insignificant, while others can be quite serious. If your dog’s vomiting is more than just an isolated incident, seek veterinary attention to rule out a critical health concern. Note: Since vomiting is such a broad issue with many possible causes, this post contains several links you can follow if you would like to learn more about a particular issue or condition. The vomiting that results may run its course, but serious illness can result if pancreatitis or dehydration develop. Dogs that “counter surf” or forage through the trash are also at risk for foreign bodies and possible poisoning, so keep a close eye out and seek veterinary attention when in doubt. 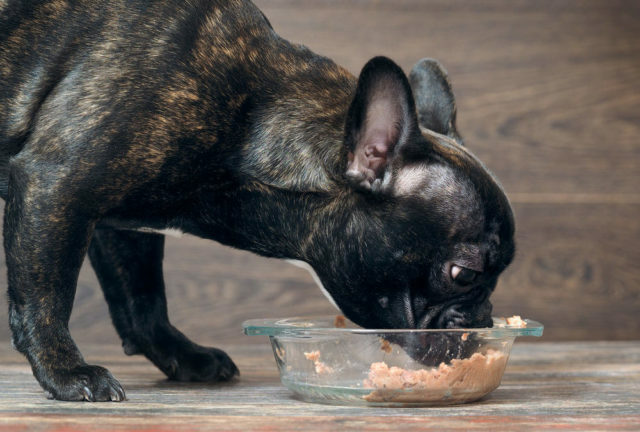 Even your dog’s own, healthy food can potentially cause vomiting if it is eaten too quickly and regurgitated, or as a result of a rapid diet change. Food intolerances/allergies are common culprits for otherwise unexplained vomiting. Some poor pups become so anxious they actually vomit. 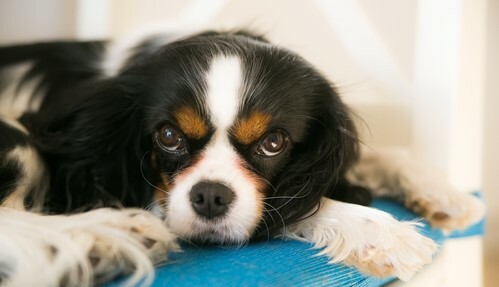 Approximately 70% of the nervous system is located in the gut, so it is not uncommon for dogs to experience tummy troubles when they are upset or stressed. 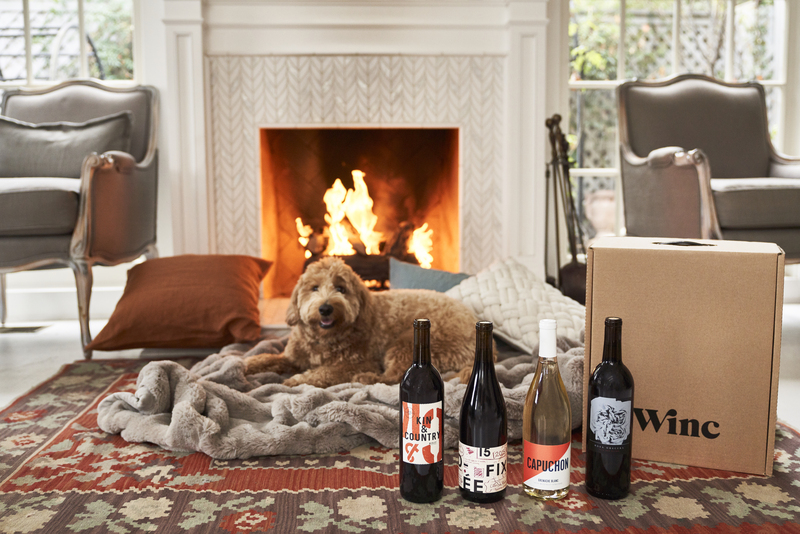 Common triggers include separation from a favorite human, car travel, loud noises from storms or fireworks, and stressful life changes like moving or introducing a new pet into the home. 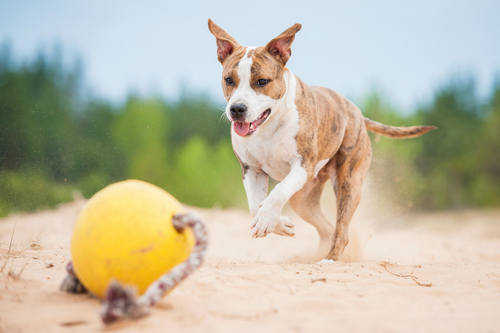 There are many types of intestinal parasites that can affect dogs. Most cannot be seen with the naked eye, and some cause no external symptoms. 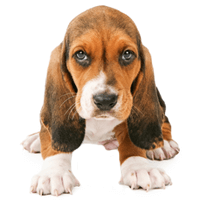 Roundworms, hookworms, whipworms and tapeworms are among the most common parasites diagnosed in dogs and puppies. While not all intestinal parasites cause vomiting, the medications given to dogs with heavy worm burdens sometimes do. As the parasites die off, the body eliminates them as waste. Roundworms and tapeworms may be seen in the vomit of infested dogs. 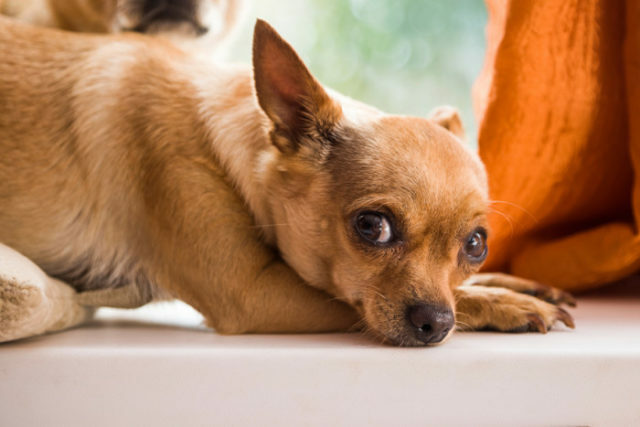 Some dogs suffer from chronic vomiting due to long-term digestive problems like gastritis, megaesophagus and inflammatory bowel disease, among others. Gastritis refers to generalized inflammation of the stomach and is usually accompanied by vomiting. It is more common in older, small breed dogs like Shih-Tzus, Miniature Poodles, and Lhasa Apsos, but it can also be caused by outside agents like drugs, foreign bodies or infections. Dogs with allergies and immune-mediated diseases are also more likely to experience chronic gastritis. The esophagus is the muscular tube that helps push food and water down into the stomach. For dogs with megaesophagus, this tube is enlarged and weakened, causing swallowed materials to passively accumulate until they are regurgitated. The disease can be life-threatening without special diets and feeding techniques. The causes of Inflammatory Bowel Disease (IBD) are not well understood. The stomach and/or intestines accumulate large amounts of inflammatory cells causing changes in the lining of the digestive tract and affecting the dog’s ability to pass and digest food. Chronic vomiting is the most common symptom. 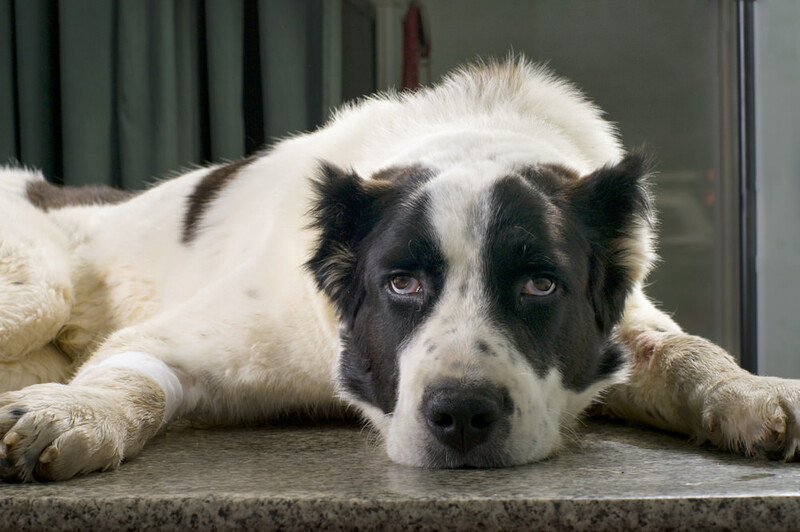 Although uncommon, some dogs have poor reactions to vaccinations, anesthetics, or medications. While vomiting does not necessarily constitute an allergy to the triggering substance, you should report it to your veterinarian. 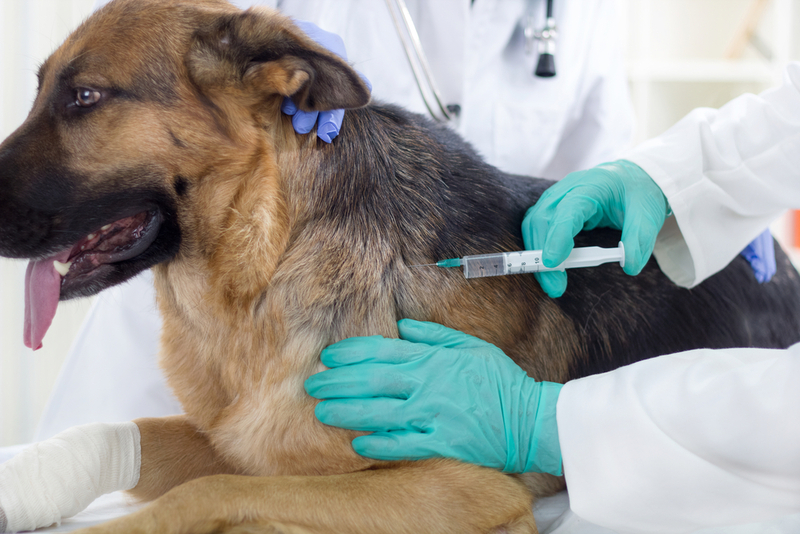 He or she may recommend bringing your dog back in for observation, discontinuing use of a particular drug, or pre-treating prior to vaccinations in the future. Anaphylaxis, the severe and life-threatening form of an adverse reaction, usually occurs very quickly, often within minutes or even seconds of exposure, and may include symptoms like trouble breathing, facial swelling, loss of urine or bowel control, and shock in addition to vomiting. Just like humans, dogs may occasionally pick up a “bug” in the form of a virus or bacterial infection. While some of these infectious diseases may pass with no long-term effects, others, like Parvovirus and Leptospirosis, can be quite serious. 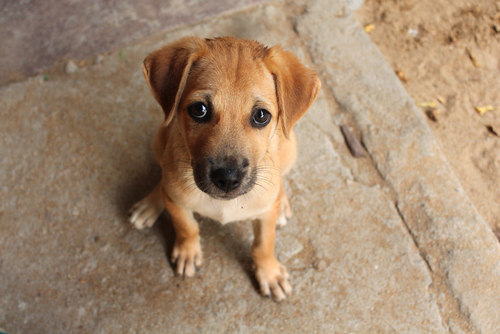 Parvovirus is highly contagious to young puppies and dogs not protected by vaccinations. The virus attacks the lining of the intestines causing vomiting, bloody diarrhea, and severe abdominal pain. Without aggressive treatment, parvo can prove deadly. 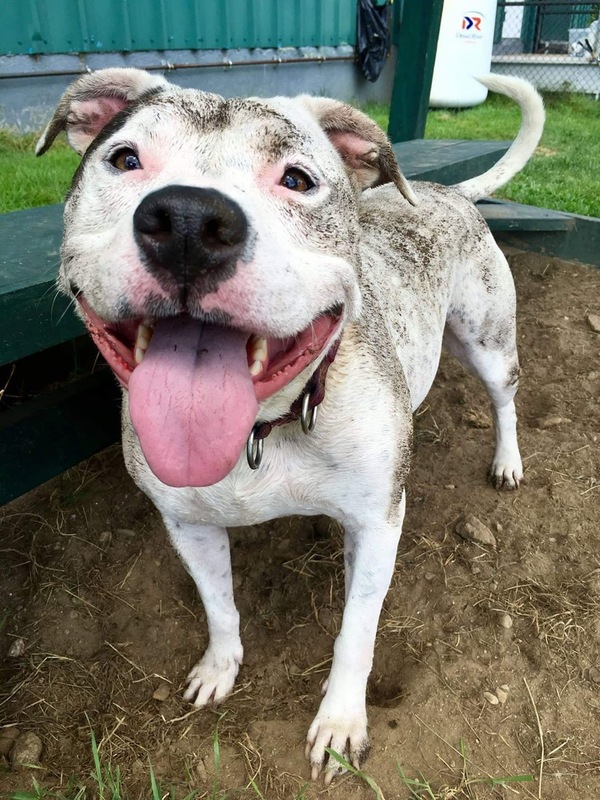 The bacterial infection, Leptospirosis is transmitted through the urine of wildlife, and often affects dogs that swim, splash or drink from standing water sources and puddles. 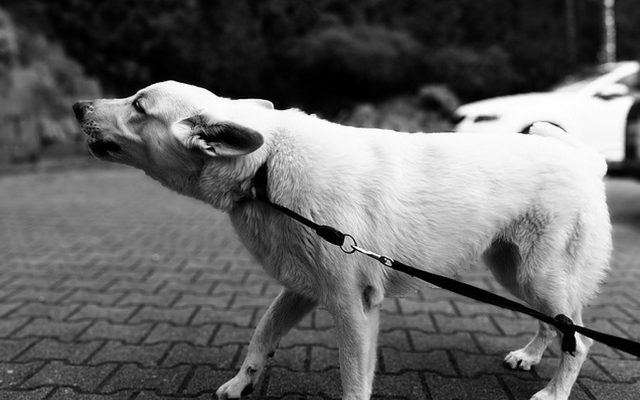 Once infected, dogs can also pass Lepto along to other dogs and human family members. In serious cases, kidney or liver failure may occur. The good news is, Lepto is treatable and can be prevented by monitoring your dog outside and choosing to vaccinate against the bacteria. Car sickness was briefly mentioned under the “Stress” heading, but the issue is a bit more complicated. While motion sickness can certainly have a fear/stress component, it can also be caused by the mechanisms of the inner ear that control balance, poor ventillation or unbalanced air pressure in the vehicle, overheating, etc. 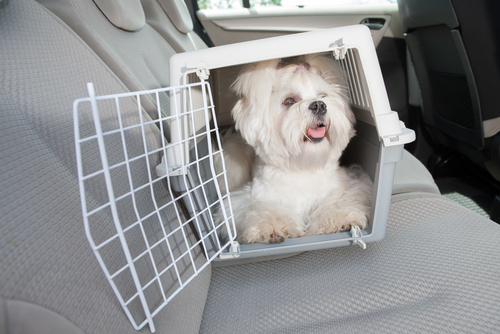 If your dog is among the one in six that struggle with car sickness, check out the tips in this post to help him better tolerate the ride. Heat stroke is a life-threatening condition that occurs when a dog becomes severely overheated. It can result in dehydration, seizures, coma, and even cardiac arrest. Although brachycephalic breeds are most susceptible, any dog can experience a deadly hyperthermia emergency if they are too active on a warm, sunny day, left in a hot car, etc. In addition to vomiting, symptoms of heat stroke include drooling, increased or irregular heart rate, stumbling, thick, sticky saliva, weakness, dizziness, and lethargy. Heat stroke is an emergency situation. If you suspect your dog is overheating, head to the vet immediately! Unfortunately, vomiting can be a symptom of many serious diseases of the kidneys, liver, and heart, as well as diabetes and certain types of cancer. 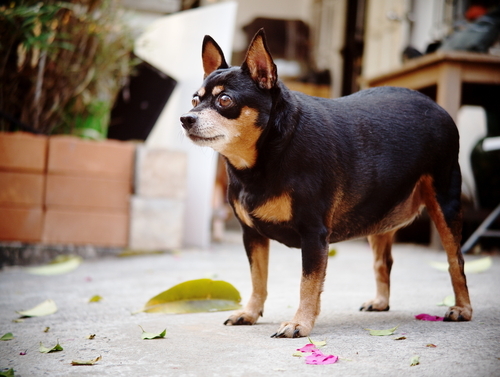 While these conditions are more common in older dogs, they do occasionally affect younger pups, especially if there are contributing factors like obesity, poor diet or acute poisoning. While recovering from a bout of gastrointestinal illness, your dog’s digestive tract may need help restoring a healthy balance of bacteria. 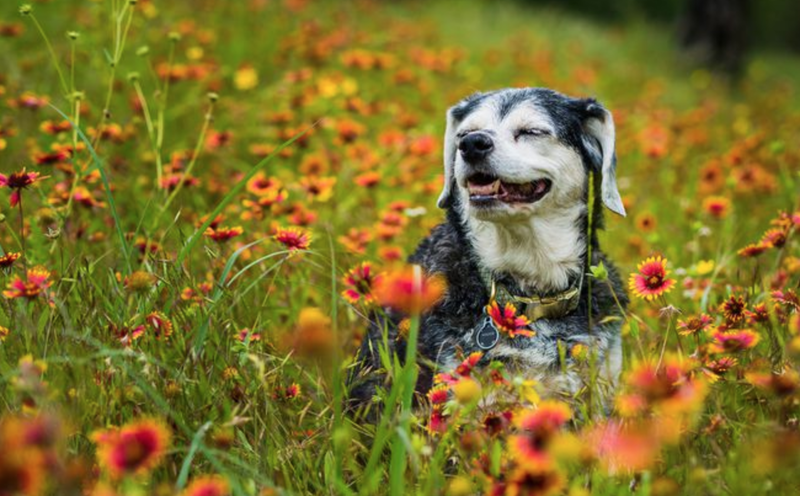 Many veterinarians recommend treating with probiotics, prebiotics, digestive enzymes, and gut-soothing herbs to sooth and nourish the natural flora in the gut. Pronine™ Flora 4-in-1 contains four digestive enzymes critical for restoring digestive balance and minimizing the symptoms of diarrhea, constipation, vomiting, gas, and loose stools. It also helps impaired systems improve the absorption of vitamins, minerals, and other nutrients. 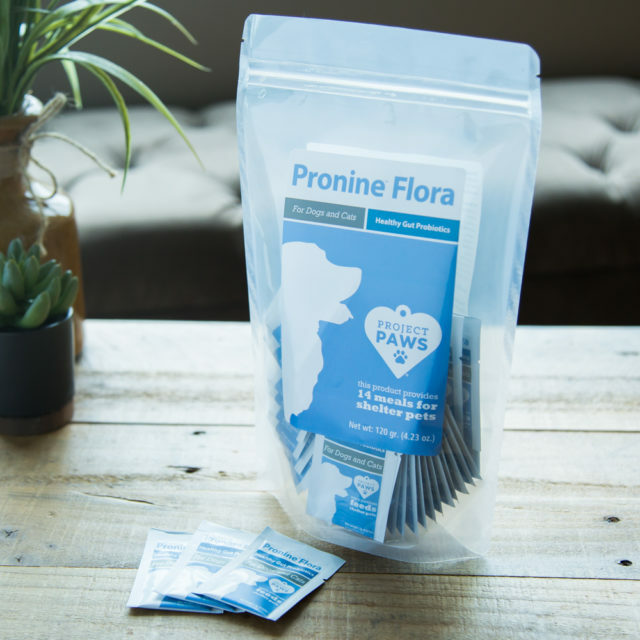 Not only does Pronine help restore digestive balance after an illness, it can also help prevent vomiting and diarrhea in dogs transitioning from one food to another; taking antibiotics; or dealing with stressful situations like moving, staying at a kennel, or recovering from an injury. Best of all, dogs love the chicken liver-flavored powder – simply sprinkle it over your dog’s food once a day!